So the special variation quickstep routine that Sengoku developed for Tatara and Mako for the solo portion of the finals were plummeted since this year couples were expected to perform a waltz routine. Unfortunate for Tatara and Mako since they had to perform a style of dance they weren't as prepared for. 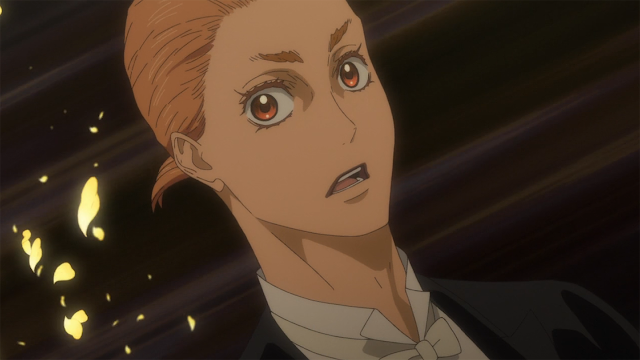 I think it was better this way that they did not perform that special variation since it threw Tatara, a beginner, off balance and showed us what he's capable of as a lead, and what type of waltz he could come up with off the top of his head. Basically 85% of the episode comprised of Tatara and Mako performing a waltz that was off the cuff.. and what the two were capable of on their own was as expected. A routine composed of simple waltz maneuvers with a sprinkle of steps from Hyoudou and Shizuku's waltz. The starting portion of their routine wasn't that... exciting to watch since it was basically the two of them performing basic waltz dance maneuvers, but even when Tatara and Mako imitated steps from Hyoudou and Shizuku, it wasn't as magical or exciting to watch since it looked like a cheap knockoff. I'm going to need Tatara to stop imitating everyone and come up with something original, it was cute at the start of the series that he had this talent in him, but it boxes the poor boy as a one dimensional character - meaning copying others can only take the boy so far. I want him to come up with impressive a routine, doesn't matter the style, by himself; a routine that he and Mako can perform that even Hyoudou and Shizuku can't imitate. 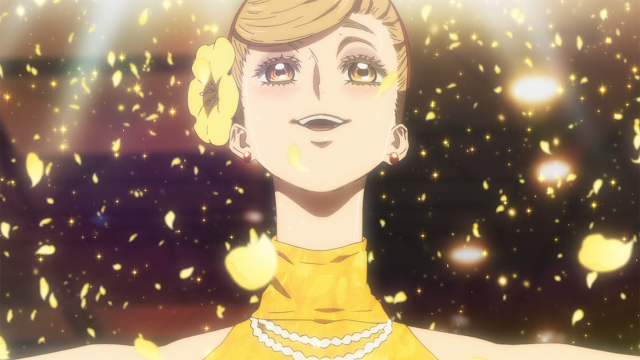 The pros in this episode emphasized the frame and flower analogy, where Tatara's the frame and Mako's the flower. How Tatara framing Mako would be crucial to whether their routine would shine or not. 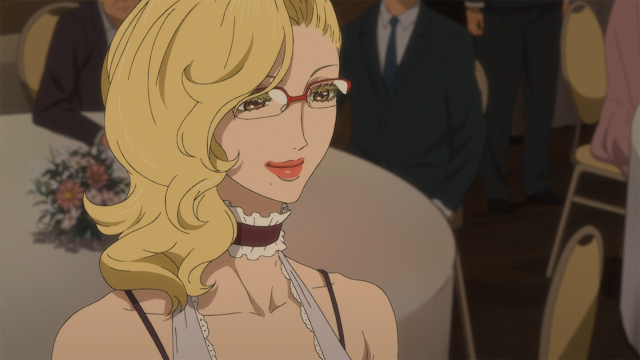 Tatara wanted to make Mako bloom, as she requested, and this was the part of the episode where the magic began. 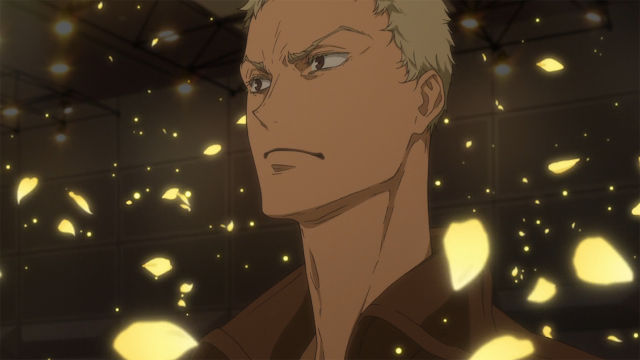 Tatara drifting off into the background to make Mako shine when she was following was mesmerizing; this was his vision of the frame and flower analogy. It was a combination of the music, taking the attention away from Tatara, and the animation that made this part of the episode so perfect to watch. I loved how they utilized the the same soundtrack used when Tatara and Shizuku did their waltz in Mako and Tatara's routine. Compounded with the the petals flowing on the dance floor. Production I.G pulled a rabbit out of their hats with this one. The music and animation was more key to highlighting Mako, than Mako herself, but hey.. this is anime. I was so happy to see Gaju shaken that Tatara could make Mako a better/ elegant dancer than he could have. Also, it was good to see the flashbacks between Gaju and Mako. Which highlighted the issues with Mako when she was paired with Gaju, and how she took the wheel and learned from her mistakes and applied what she learned in present time with Tatara. The anime could use more of these flashbacks, or more one-on-one time with each of the main characters, since we don't really know much about the characters on a personal level nine episodes in. I would love to know more about them besides the fact that they enjoy ballroom dancing, and besides watching everyone prepare from cup to cup. Anyways, Mako was shining in this episode and no one could deny that! Next week's episode should be great, hopefully we learn more about the main characters and we get to see how Shizuku and Gaju are going to counter Tatara and Mako's beautiful performance.